"Fashionable Weddings Mark Return of Pomp to London"
The opening of parliament by the king and queen, with all the pomp of olden days that had been discontinued during the war, brought a good many people to town who otherwise would have remained in the country, and for a week or so the big hotels and restaurants were full of well-known faces, pretty women, and lovely clothes. Fashionable wedding have also attracted the attention of the public, and, of course, gave rise to the gossip which, as a rule, attends events of that kind. The most important among them was that of the youthful Marquess of Blandford  with the Hon. Mary Cadogan , about which a great deal was said and a great deal more left unsaid, but whispered from ear to ear. Every one of the innumerable people invited to attend it was more or less keen to see the meeting of the Duke and Duchess of Marlborough , and, of course, rumors had arisen that this auspicious occasion of the marriage of their son and heir would bring about a reconciliation. But once more gossips had to retire into the background, because no such result followed the ceremony at St. Margaret's Church, Westminster. The wedding was unusually brilliant. Not only the king and queen but also Queen Alexandra were present. The two royal ladies were attired in purple velvet, with the difference that the dowager wore over her dress a gorgeous cloak of black jet which was a pronounced wonder, whilst her daughter-in-law had over her shoulders a wrap of most magnificent ermine that reached nearly to her ankles. The bride was pronounced lovely and her dress a perfect wonder of good taste and simplicity, but to the general surprise the wedding presents were quite insignificant, with the exception of those of the royal family and the row of pearls given by the Duchess of Marlborough to her new daughter-in-law. Mr. Vanderbilt  gave a house in London to his grandson, but this could not be laid upon a table, as were the other gifts showered upon the young pair, and was consequently overlooked by the guests, who commented upon the simplicity of the things spread before them. The wedding reception was held in the town house of Lord Farquhar , who lent it for the occasion, as everybody agreed as to the unseemliness of holding it at Sunderland House , where it would have been rather difficult for the Duchess of Marlborough to welcome as a guest her own husband, and as Sir Hedworth and Lady Meux's London residence  was not considered large enough to accommodate the many people bidden to such an important social event as the nuptials of the heir to the titles and honors of the illustrious house of Churchill. 1. In 1920 the Marquess of Blandford was Lt. Col. John Spencer-Churchill. He was the 10th Duke from 1934 until his death in 1972. 2. The Hon. 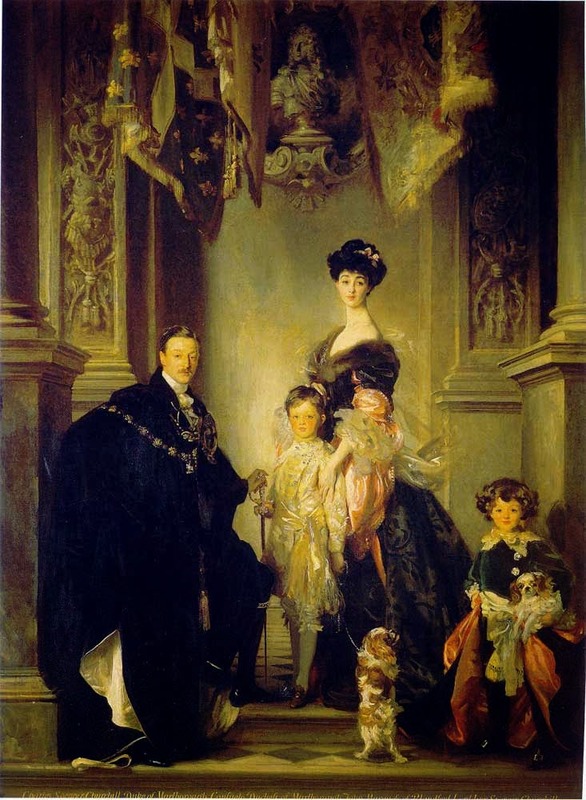 Alexandra Mary Cadogan was the daughter of Viscount Chelsea, eldest son and heir of the 5th Earl of Cadogan. He died in 1908, and the earldom was inherited by his brother. The bride's mother was the Hon. Mildred Cecilia Sturt, who remarried to Sir Hedworth (Lambton) Meux after the her first husband's death. Mary, the new Marchioness of Blandford, became a duchess in 1934; she gave birth to five children, including the 11th Duke, and died in 1961. 3. Charles Spencer-Churchill, the 9th Duke of Marlborough, and his first wife, Consuelo Vanderbilt. The couple finally divorced in 1921 after a fifteen-year separation. 4. The groom's grandfather was William Kissam Vanderbilt, a millionaire railroad tycoon and a grandson of Cornelius "the Commodore" Vanderbilt. He died only a few months after the wedding. 5. Viscount Farquhar (later the 1st Earl Farquhar) was a Tory politician who served as the Lord Steward of the Household at the time of the Blandford wedding. His London house, where the reception was held, was at 7 Grosvenor Square. 6. Sunderland House, on Curzon Street in Mayfair, was the London residence of the groom's mother. The Marlboroughs had built it together, financed by Consuelo's father, before their separation. 7. The home of the bride's mother and stepfather.